Baby Dino Framed Pictures. 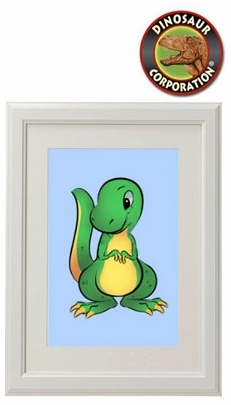 The exclusive collection of baby dino pictures for your child room decoration. Framed in 9 1/4" x 12 1/4" off white frame. To place order: In our store on-line or call our customer service Tel: 800-970-1128 or send your order by fax: 360-835-7188. We are accepting payment via Purchase Orders, Credit Cards Visa, MasterCard, AMEX, Discovery and PayPal. To open wholesale account please e-mail or fax us copy of your Resale Certificate/Business License.